re-manufactured Powerstroke engine Archives - Asheville Engine, Inc.
Asheville Engine is the leading independent Navistar / Powerstroke builder of Ford Powerstroke re-manufactured engines in the U.S. Many of our customers have surpassed 300,000 to 400,000 trouble free miles with their re-manufactured Asheville Engines because nobody builds a better Ford Powerstroke. 6.0 Powerstroke Short Blocks start at $2,995. with ARP Studded Long Blocks selling from $4,895. Visit our web site for 7.3, 6.4 and 6.7 prices. We offer a lot of great upgrades to give you better performance and longevity from your Ford Powerstroke re-manufactured engine. All prices are on our web site because we want you to have the best experience possible. Just click on the 6.0 Powerstroke and a drop down list will pop up. You can use that drop down list to basically build your own engine the way you want it. From a stock replacement to a 1,000+ horsepower beast, Asheville Engine has built a reputation of building the best. 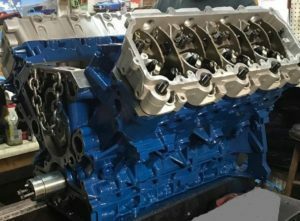 Ford Powerstroke re-manufactured engine / 6.0 short block for Asheville Engine, Inc. If you are looking for a Ford Powerstroke re-manufactured engine to replace your 7.3, 6.4 or 6.7 Powerstroke, we offer those,too. We also sell a variety of 6.0 rebuild kits and 6.4 rebuild kits from a stock build to one that can handle anything for the do it yourself engine builders. We sell Stage 2 camshafts, gasket sets, ARP head studs and EGR Delete Kits, too. Go to our web site and click on “PRODUCTS” to see everything we offer. Other companies may try to sell you a Ford Powerstroke re-manufactured engine by offering you a better price or try to make more money off you by giving you a warranty that sounds too good to be true. As a result, you could end up getting a substandard engine or even get shafted when you need some help. Don’t be fooled by these sales pitches. Anybody can build one cheaper by re-using pistons or other internal parts that you can’t see and a longer warranty can easily be denied when you need it. 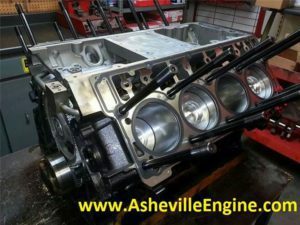 Asheville Engine builds our engines with new parts and we give you an honest 12 month/ unlimited mile warranty. The only thing better than our engines is our reputation. Asheville Engine is the nation’s leading independent Ford Powerstroke diesel engine builder. We sell every Powerstroke engine ever produced, Whether you are a diehard 7.3 Powerstroke fan, love the 6.0 Powerstroke, own a 6.4 Powerstroke, or drive a 6.7 Powerstroke, Asheville Engine understands what you need…it’s all we do! We offer a 6.0 Powerstroke short block starting at $2,995.00 and a studded long block with ARP 250-4202 head studs from $4895.00. All details and prices are on our web site. Most of our customers are average guys hauling a camper or a boat on the weekend, pulling a landscape or construction trailer or using it as a daily driver but we have customers who drive commercially and rack up 100,000 miles per year. Several of them have put up to 500,000 trouble free miles on their remanufactured Asheville engines. We also build high performance Powerstroke engines. Lee Jenkins in southern Mississippi had us build an engine for him which took the “TOP POWERSTROKE” award at Diesel Thunder in Gulfport, MS in November 2016 and it registered 1,054 HP on the dyno at Diesel Thunder in Holt. FL in March of 2018. Paul Barber in Washington State entered his first sled pulling competition in October 2018 and his second pull was over 303 feet! The only thing better than our engines is our reputation! If you are looking for a company that’s been in business a long time and has built thousands of Ford Powerstroke engines, give us a call or shop on our web site at www.Asheville Engine.com because our customer service is second to none.